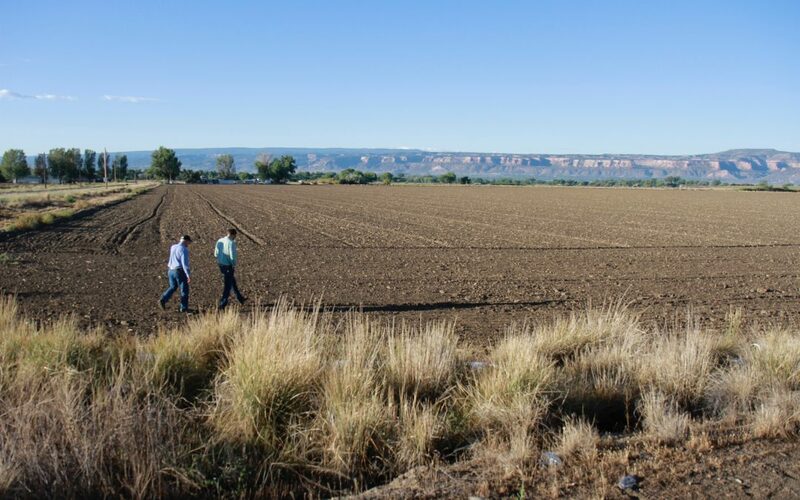 Mark Harris with the Grand Valley Water Users Association stands with Luke Gingerich of JUB Engineers in a fallowed field west of Grand Junction. The field was temporarily dried up in 2017, with water sent downstream toward Lake Powell, in an effort that could be a step toward creating a water bank on the Colorado River. Western Colorado’s Grand Valley is known for its agriculture, from the peach orchards and grape vineyards at the foot of the Colorado Plateau to the verdant waves of alfalfa near the Utah border. Yet this past summer, a handful of Grand Valley farmers were paid to grow nothing at all. It’s a test of an innovative scheme called water banking. The concept is to send the unconsumed water, normally used by those farmers, downstream to Lake Powell to bolster low reservoir levels. This voluntary, compensated program aims to stave off future water shortages that could endanger all who rely on the Colorado River—from western Colorado farmers to Front Range cities. It sounds paradoxical, but temporarily fallowing some farmland now could help prevent the permanent dry-up of farmland in the future. 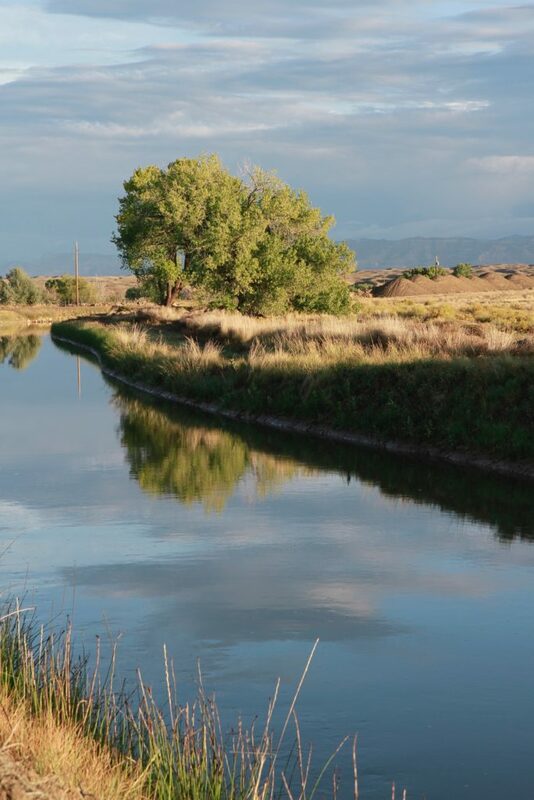 Under the program, 10 members of the Grand Valley Water Users Association (GVWUA), which operates the historic Government Highline Canal, have taken 1,250 acres of land out of production this year, receiving $560 per acre to help make up for the alfalfa, corn or wheat they would otherwise have grown. Funding comes from the System Conservation Pilot Program and from the Colorado River Water Bank Work Group, a coalition that has been studying water banking since 2009 and includes the Colorado River District, the Southwestern Water Conservation District, The Nature Conservancy, Tri-State Generation and Transmission. Participating farmers must submit to periodic inspections and keep their fallowed land free of irrigated crops and weeds alike. To protect the GVWUA’s water rights, the water they would have used is diverted as usual from the Colorado River just northeast of Palisade and run through the Grand Valley Power Plant to generate hydropower, then returned to the river. In 2017, the pilot project returned an estimated 3,200 acre-feet of water to the Colorado River that would otherwise have been consumed by crops, according to GVWUA general manager Mark Harris. It’s a drop in the bucket compared to the 7.5 million acre-feet that Colorado and its neighbors in the Upper Colorado River Basin are required to ensure reaches the lower basin in an average year under the 1922 Colorado River Compact. Yet the program is an important first step in testing the theory that farms and cities could partner to replenish water levels in Lake Powell, the 254-square-mile reservoir that effectively serves as a bank account where upper basin states deposit the water that is later released to the lower basin. Should Lake Powell levels continue to fall and reach a point below where the Glen Canyon Dam, which creates Lake Powell, can generate power, a line of undesirable dominoes could begin to fall. Important revenues from power generation that fund operations and environmental programs would crater. At that low reservoir level, with the power plant penstocks above water, the dam would not be able to deliver enough water for the upper basin to meet Colorado River Compact obligations. In such a scenario, the lower basin could issue a so-called “compact call,” where water rights appropriated after 1922 could be subject to curtailment until the lower basin gets its share. Thus the upper basin states would actively and quickly work to reduce agricultural or even municipal water use. If dry conditions were to persist and legislative changes weren’t made, East Slope water managers would likely adapt by buying up water rights that predate the Colorado River Compact of 1922, many of which are now used to irrigate West Slope farms. That could lead to the permanent dry-up of much Western Slope agriculture, an outcome that most Coloradans would hate to see. “Our water rights would probably be looked at as very desirable in the event of a compact call, and I’d like to be part of a solution that prevents that call from ever happening,” says Joe Bernal, 54, who farms 900 acres in Loma, Colorado, west of Grand Junction, serves on the board of the GVWUA, and plans to fallow 160 acres of his farmland when the pilot program continues in 2018. As a tool for averting a compact call, water banking could expand in the coming years. Aaron Derwingson, the Colorado River agricultural coordinator for The Nature Conservancy and a member of the water bank work group, says his organization is investigating at least six small-scale water banking pilot projects downstream in Utah, and others are underway on individual farms and ranches in Colorado. Yet the conditions required for a successful water bank are rare and tough to foster, Derwingson says. To begin with, water banking requires legal protections to “shepherd” unused water downstream without allowing its diversion by other water users. In the Grand Valley, an absence of downstream diversions assures the water’s safe passage to Lake Powell. Such favorable legal conditions are unlikely to be replicated elsewhere, meaning downstream water users could divert the unused water before it reaches its intended destination. In Colorado, there are some existing tools to shepherd conserved water downstream—including instream flow water rights—but it remains to be seen whether additional legal protections are required to enable water banking across the Colorado River Basin. It’s also unclear how future water banks will be funded. While the Front Range Water Council has funded water banking in the past, and there are pilot programs like the System Conservation Program, in which Denver Water and others provide funding for projects to reduce water demand in the Colorado River Basin, some utilities may be ambivalent about footing the entire bill for water banking programs. So The Nature Conservancy is pursuing collaborations with corporations like PepsiCo that might be willing to invest in water security and fill the funding gap. Finally, questions of governance—who runs a project, who makes decisions—will dog the creation of any new water banking entity and can take years to resolve, Derwingson says. Aside from working to enroll somewhere between 15 and 20 of its members in an expanded water banking program in 2018, the GVWUA has also been offering tours and advice this past year to many water providers interested in launching pilot projects of their own. Yet Bernal and others worry that scaling up water banking significantly could have ripple effects across the agricultural economy—from farm equipment suppliers to feed stores—as more land is temporarily removed from production and farmers spend their money outside of the farming sector.